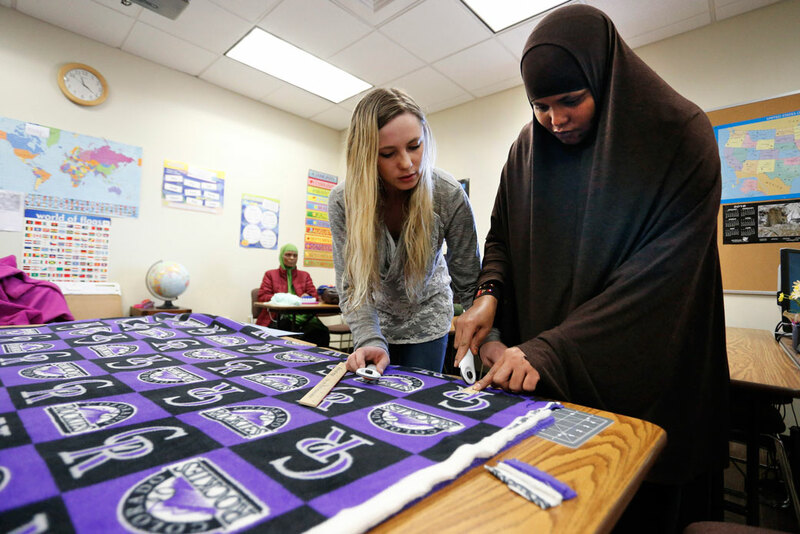 A Somali refugee student works with a teacher in a career pathways class at Morgan Community College in Fort Morgan, Colorado, February 25, 2016. Here’s what you need to know about our foreign-born population and its impact on the economy, current immigration policy, and voting power of new Americans. Immigrants added an estimated $2 trillion to the U.S. GDP in 2016.62 Immigrants are overrepresented in the labor force and also boost productivity through innovation and entrepreneurship. Ending DACA and kicking recipients out of the labor force would cost the United States $433.4 billion in GDP and decrease Social Security and Medicare contributions by $24.6 billion over the next decade.79 As of November 2016, 645,000 DACA recipients are employed.80 Through this employment, DACA has broadened the payroll tax base, increasing Social Security and Medicare contributions. The Border Patrol publishes several key metrics gauging the effectiveness of enforcement efforts. The effectiveness of these metrics is limited, however, and there is much room for improvement. When local law enforcement becomes entangled with immigration enforcement, it has a chilling effect on immigrant communities. Such cooperation may lead immigrant communities to fear the police, making them reluctant to report crimes.160 A 2013 study found that police involvement with ICE leads to a 70 percent decrease in the likelihood that unauthorized immigrants report crimes to the police.161 Further, state and local enforcement of federal immigration laws often leads to racial profiling.162 Local officials often have a better understanding of communities than their federal counterparts. From January 25 to 27, 2017, President Trump unveiled three executive orders mandating sweeping changes to immigration enforcement and reversing many policies enacted by the Obama administration. The first two executive orders expand border security and interior enforcement. The third executive order promised to impose a moratorium on refugees and institute a travel ban barring nationals of seven Muslim-majority countries from entering the United States. Implementation of that executive order was enjoined by multiple federal courts, and the order was rescinded and replaced with a revised executive order that has itself been preliminarily enjoined. On January 27, President Trump issued an executive order designed to ban Muslims from entering the country and limit the refugee resettlement program. This executive order would have suspended the entry of citizens of Iran, Iraq, Libya, Yemen, Sudan, Syria, and Somalia for a 90-day period. It also would have granted the DHS discretion to expand the geographic scope and duration of the ban. Furthermore, the order would have suspended all refugee admissions for 120 days and all refugee admissions from Syria indefinitely.226 After 120 days, refugee admissions would have been limited to specific countries and would have prioritized religious minorities. Michael Nicholson is a doctoral candidate in political science at the University of California, San Diego. Prior to starting graduate work, he worked as a research analyst at the Federal Reserve Bank of Dallas. He has also held internships at the Migration Policy Institute’s Transatlantic Council on Migration and at the U.S. Department of State. He spent the 2015-16 academic year as a Marie Curie Fellow at the University of Amsterdam, Netherlands, and held a Fulbright scholarship in Istanbul, Turkey, in the 2005-06 academic year. He holds a Bachelor of Arts from the University of Pennsylvania. The author thanks Tom Jawetz, Sanam Malik, Nicole Prchal Svajlenka, and Philip E. Wolgin for their help. * Correction, April 20, 2017: Misprints in the web version of the report have been corrected to match the correct values in the PDF version; the web version now includes accurate numbers when describing the breakdown of foreign-born residents and lawful permanent residents in the United States.